Powered by an HD live camera and two-way audio, Belle functions as a 24/7 on-shift liaison between the house owners and their visitors. Through Netvue’s mobile app, the real-time view in front of the home entrance is available with a network connection and communicates with guests on a constant basis even when the house owner is away from home. With the infrared night vision, video monitoring in the dark is no longer a blurry sight. Belle’s integration with AI technology makes it stand out among its competitors. Leveraging AI deep learning and voice interaction, Belle is capable of having intelligent interaction with people by constantly studying and adapting to human behavior and speech pattern. Supported by the facial recognition technology, Belle is able to remember and identify frequent visitors. Besides greeting them with basic conversation, Belle will distribute visiting requests via Netvue’s mobile app to the respective home member for remote instructions. As a smart doorbell passing on fun and joy, it even comes in choices of three personalities to choose from. Beyond its HD live feed and AI integration, Belle has also offered advanced motion alert and cloud video recording service. Its motion detection zones and sensibility can be customized to avoid false alerts like street traffic and focus on objects getting close to the front door. Belle offers three kinds of cloud recordings: Instant Alert Storage of unusual activities for up to seven days, Ring Video Storage of visitor conversations and 24/7 Cloud Recording of the monitoring views, playback of which is available anytime at request. About Netvue: As a leading innovator in the home security industry, Netvue is committed to enhancing the quality and safety of households through cutting-edge technologies. Backed by a core R&D team with members from top technology powerhouses and world-renowned universities, Netvue pioneered numerous security applications in the home setting with a portfolio of proprietary IPs in many key fields. Amazon Acquires Blink, Maker of Wi-Fi Security Cameras and Video Doorbell. Blink will help Amazon compete with Google’s Nest, which began offering its own security system earlier this year. Based in Andover, Mass., Blink was launched after a crowdfunding campaign raised more than $1 million for its wireless home monitoring system in 2014. The company manufacturers products that are compatible with Amazon’s smart home line, Echo. Blink Home Security Systems will help Amazon compete with Google’s Nest, which began offering its own security system earlier this year. 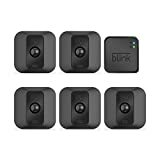 Blink cameras record a short clip each time they detect motion and send the video to the end customer’s mobile devices. The cameras, at $99, are less expensive than those of many competitors and are said to run for up to two years on a pair of AA batteries. The acquisition may also help Amazon improve its new Amazon Key in-home delivery system, which does not yet currently work with an alarm system. By linking in with Blink’s forthcoming security system, it would allow drivers to potentially deactivate a home alarm instead of requiring a user to deactivate their system on the day of the delivery. For professionals who recommend, buy and install all types of electronic security equipment, a free subscription to Security Sales & Integration is like having a consultant on call. You’ll find an ideal balance of technology and business coverage, with installation tips and techniques. Do You Agree, Students Should Carry Non-Lethal Weapons on Campus? A bill in the Arizona Legislature would allow students to carry non-lethal weapons on campus. Current legislation permits some types of pepper spray on campus so long as they don’t contain oleoresin capsicum, the active ingredient in most pepper sprays. HB 2172 seeks to change that by allowing students to carry any non-lethal weapons on campus in the name of self defense. Non-lethal, as described by the bill, applies to anything that would explicitly repel an assailant with a low probability of lasting damage to them or the environment. This would include TASERs, stun guns, knives and mace, said the bill’s sponsor, Rep. Travis Grantham (R-Gilbert). A similar bill, HB 2072, was introduced in 2016. It would have allowed for students to carry firearms on campus in the name of self-defense. The bill never made it to committee. Do You Agree, Students Should Carry Non-Lethal Weapons on Campus? How many people moved to Texas? Texas ranked second in the nation for total incoming residents and net migration in 2016, according to the Texas Relocation Report released by the Texas Association of REALTORS®. At 531,966 new residents for 2016, it was the fourth consecutive year Texas added more than a half million people from out of state. That total is slightly less than the previous year, but net migration was positive at 87,656 because of a drop in the number of people moving out of state. Texas came in behind Florida and ahead of California for incoming residents but was behind both states in resident outflows for 2016. Residents who left Texas were most likely to move to California, Florida, Oklahoma, Louisiana, or Colorado. About 55% of new Texans came from other U.S. states, with California leading followed by Florida, Oklahoma, Louisiana, and Illinois. “Despite slowing job and economic growth over the last two years, housing-market and population growth have remained strong and steady throughout the state,” said Kaki Lybbert, 2018 chairman of the Texas Association of REALTORS®. “With more than half a million people moving here each year, it’s evident that the Lone Star State fosters a positive environment. “The DigiLock”: Automatic Keyless Entrance to Residence Adds to Personal Security. Years ago, many individuals did not bother to lock their homes or other buildings. That is not the case today. Personal security is vitally important and when arriving home, it is a benefit to have immediate occupancy. That is possible when using the new DigiLock. The DigiLock is a transmitting and receiving system that is specially designed to be used in conjunction with the front and back doors of a home or business. The design intent is to enhance home security by providing consumers with a means of keyless entry and exit. And, because the Digi Lock would unlock one’s door with a simple push of a button, instead of fumbling with keys, users could get inside faster thus reducing the risk of a mugging or attack. The DigiLock is a lock system specially designed for doors containing a built-in receiving unit operated by a corresponding remote-control transmitter. It is sized to fit the standard cutouts on most doors. The Digi Lock deadbolt is hardened steel featuring a combination of wood and plastic housing. A receiver circuit, along with a tuned frequency, is encased within the lockset’s sturdy housing. In addition, a flashing, red light emitting diode (LED) is incorporated into the design of the lockset and offers an indicator that the lock has been activated or disengaged. The rectangular remote control resembles the standard keychain variety remotes common to automobiles with two buttons to activate the system’s lock/unlock capabilities. A frequency generator, amplifier, internal antenna, and the required electrical/electronic components and circuitry are encased within the unit’s durable plastic housing. The remote-control pendant also has a flashlight. Both the receiver and transmitter of the DigiLock are powered by a coin-cell type battery, and feature a red LED to indicate a low battery state. Aging in Place Begins Early. Homeowners are getting older, and to continue on in their current house, improvements are necessary. According to HomeAdvisor, a “holistic” movement is occurring—a comprehensive, and, at times, preventative, approach to living over the years. Early on, that could mean addressing issues that could be unsafe, like a cracked walkway. Later, that could mean cutting clutter and organizing (accessible storage, for example), or eliminating labor-intensive chores, such as adding gutters that clean themselves. The outcome is a lifestyle that is not only beneficial currently, but also crucial down the line, when age can impede the ability to carry out chores and upkeep. A Reverse Mortgage is a mortgage offered to men and women over the age of 62; It makes it possible for Seniors to convert a part of the of their home into cash. From powerful pink to minion yellow, these are the hues you can look forward to seeing in home design next year. Pantone Color Of The Year. The Pantone Color of the Year represents a certain rejuvenation. It is the annual announcement that wipes this year’s color slate clean and forecasts what shade will refresh the design world in the year ahead.What color could possibly pull all of it off? It’s called Greenery. Interior Color Trends For 2018. Sherwin-Williams predicts that 2018 will embody the spirit of contemporary life with their three color palettes: Affinity, Connectivity, and Sincerity. Each one is inspired by the collective culture of the moment — from fashion to technology — and captures the aura of a year that is bound to be full of progress. This color story of striking blue, animated fuchsia, and stabilizing brown, the Affinity palette is set to celebrate the connection of people and places. Affinity is just like any good getaway: relaxed but full of unexpected fun. Decorate accordingly with a base of neutral browns and vibrant accent colors in an array of pinks and blues. The Connectivity palette draws from innovations in tech, including pixelated oranges, digital blues and greens, and high-def yellow. Minimalism isn’t going anywhere in 2018. However, it is taking on a less structured look. So Who Gets The Dog In A Divorce? So Who Gets The Dog In A Divorce? We’ve all seen it on television. Two people, on opposite sides of the room, both calling a dog’s name and waiting for brownie to pick a side and go home with one of them. But starting Jan. 1, divorcing couples won’t have to fight like cats and dogs over their animals. On Jan. 1, divorcing couples won’t have to fight like cats and dogs over them and longer. A change to the Illinois Marriage and Dissolution of Marriage Act means judges can treat companion animals a little less like possessions and a little more like children, taking into account a pet’s welfare when making a decision about where he or she will live. The animals are still considered property, but the new version of the act acknowledges how important pets can be. How long do you think it will be before Texas passes this law? So many different stories swirl around: From the couple who were ordered to take one pet each, to the woman who lost her dog to her husband, merely because he was the one who’d bought it (even though she was the one who cared for the pet). “Even though it’s not like with children, considering the well-being of the animal is still totally new. I think the judges might have done that anyway.